Dads stand by us, protect us, and guide us. We look up to them. 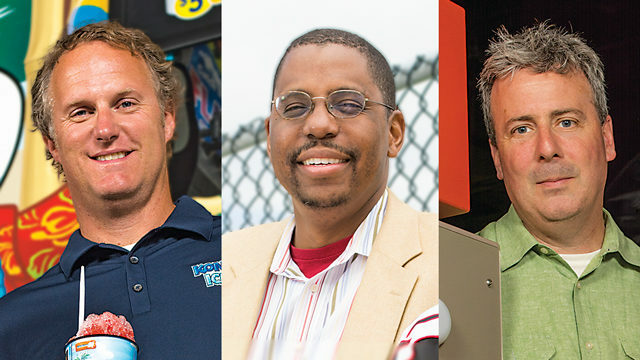 And even though we might not realize it now, a lot of that sage advice they are dishing out is sinking in. 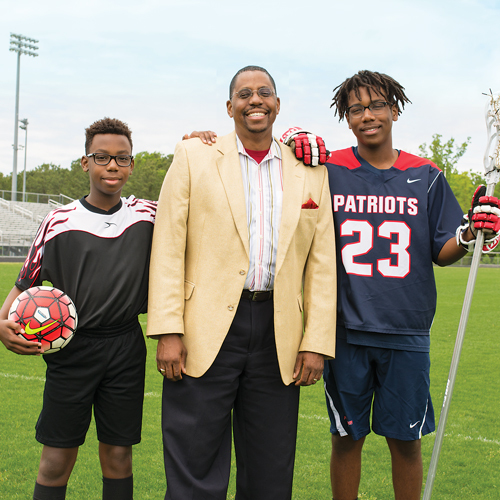 This month, as we celebrate Father’s Day, we thought it would be enlightening to check in with three Richmond-area dads and see how they navigate one of life’s most important journeys – fatherhood. 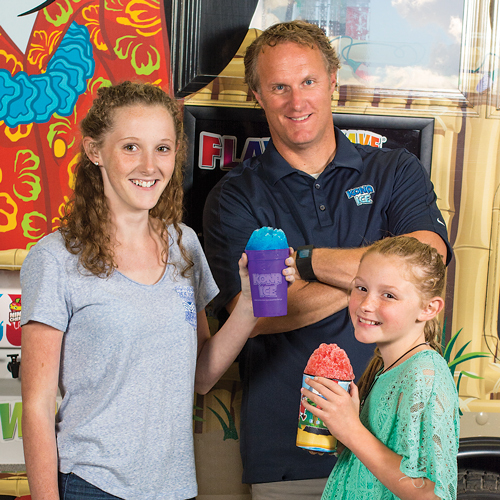 The one lesson Tim Dearing, owner of Kona Ice Central Virginia, hopes to teach his two daughters – Kaya, ten and Samantha, thirteen – is the value of paying it forward. It’s a fundamental principle that Tim holds close to his heart. to help her meet her deductible. The family has a quiet dinner together at least four or five nights a week with no television blaring in the background. “I grew up in the old school – my folks were the same way then. We had to turn off electronics,” Tim says. Tim and his wife, Andrea, have also taught the girls the importance of spending money wisely. “We provide avenues for them to earn money by doing chores,” Tim says, noting the girls do the 52-week challenge where they have to put a growing amount in savings each week. For example, the kids chip in a dollar the first week, and fifty-two dollars the last week of the year. If they complete the challenge, their parents match the amount they saved. His goal has always been to be involved with his two sons, Grant, twelve, and Miles, eighteen. His wife, Jamelle, was the former school superintendent in Hanover and is now dean for professional and continuing studies at University of Richmond. “My wife’s career has certain demands,” he says. “Early on, I wanted to make sure we could be parents together. I wanted and needed to have flexibility in my job for whatever had to happen to take care of our two sons. I wanted to be involved and stay involved with our children.” Jamelle was working on her doctorate when the boys were younger, creating more time for James to focus on the children. “There were times when it was just me and them, when it might not have been the case otherwise,” James says. The couple shares parenting responsibilities. “We try to look at each other’s calendar. We take time off to go to our sons’ events,” James says. The boys are both involved in church and sports; Grant plays soccer and Miles plays lacrosse. “Both of them were in the band at Liberty Middle School when they were younger,” James says. When he has time, James likes to discuss interesting articles he has read with his sons. “The kids will always roll their eyes, and probably think to themselves, ‘Dad has something else for us to read,’” he says. John Sarvay “Dad was of an older generation, a 100 percent working dad for 80 percent of his life. is back home now with Jack. Spending quality time with their children is important to the couple. John tries to limit his evening engagements in order to be home by five-thirty so the family can fix dinner together. Now that the weather is warmer, they take walks around their Northside neighborhood. Jack rides in the stroller, and Thea keeps up on her scooter. John’s parents divorced when he was seven. He and his two siblings lived with their mom. “I had a mother who worked really hard, and was strong in her determination to raise her kids well,” he says, noting that his mom taught him not only the value of hard work, but also the importance of creating interesting experiences for your kids that will help expand their perspective. 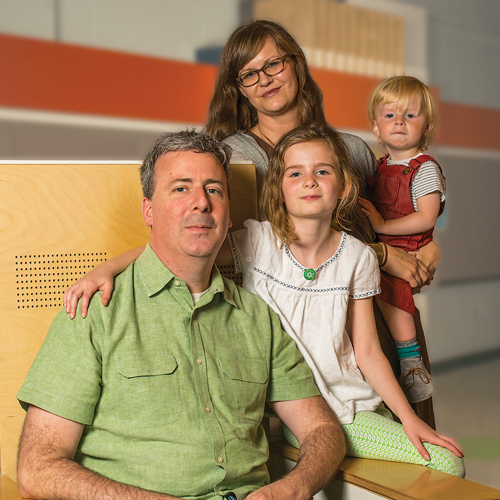 Some weekends, the family will find innovative recreational opportunities around Richmond. During spring break, John and Thea rode around town on GRTC buses. They had breakfast downtown, and lunch in Carytown, where Thea scored a book and a toy before taking a bus home. What does he want his kids to learn from him? “I hope that they learn the value and importance of community and family,” he says.